My friend has a beautiful grand-baby, Sabrina. Sabrina is special needs, and the sunshine in their life. This beautiful little girl is very sick, and currently in the PICU. They have known since her daughters pregnancy that Sabrina was going to be special, but things have been difficult since her birth. If you can find it in your heart to help them, it would be greatly appreciated. If you can't afford to help financially, support and kind words are wonderful as well. You can donate via WePay, or leave words of encouragement on their facebook page. Sabrina Jean Marie Herrera began having medical problems even before she was born. When her 17 year old mother Bethany was 20 weeks pregnant an ultrasound told us that Sabrina was a girl, but it also told us that she had a stroke. By the time Bethany was ready to deliver, Sabrina’s doctors had lost count of the amount of strokes she had and had little hope for her. She was born September 08 of 2010. She was born screaming. Shortly after her birth we found out that she had a rare genetic disorder called MTHFR and something called lipoprotein alpha deficiency. We knew she was going to be special to everyone. Since that day 20 short months ago, her list of challenges has grown. 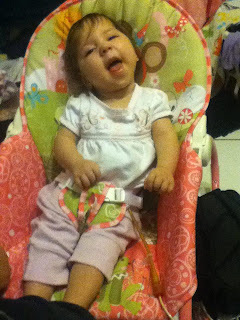 She has Cerebral Palsy, Epilepsy, Failure to thrive, respiratory issues, hydrocephalus and she is blind. Recently she has become gravely ill with pneumonia and an additional infection. She requires a lot of support, her grandparents and mother work very hard to take care of her. Unfortunately there are things that Medicaid does not cover. Sabrina has always been a fighter. We are asking for you to help us fight. For updates, please visit Sabrina's facebook page.